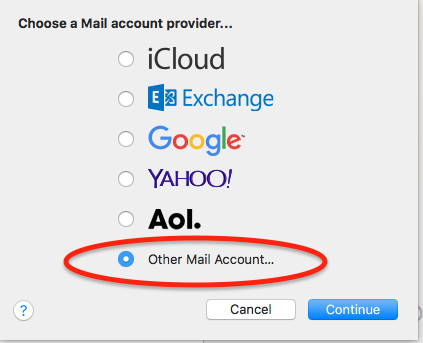 Choose Other Mail Account... then click the Continue button. Enter your real name (i.e. Emily Brown) in the Name Field, your new Brownrice email address in the Email Address field, and your new Password. We recommend that the Account Type is set to IMAP as IMAP allows email and folder syncronization between all of your devices and works with our Advanced Spam Protection. However, if you prefer you select POP and use that instead. Enter mail.brownrice.com into both of the Incoming Mail Server and Outgoing Mail Server fields. That's it! You are now ready to send and receive emails in Mac Mail! Important Note: If you have trouble SENDING email follow these instructions.